Could anyone tell me how to adjust the mixture on the standard Strombergs? Seems that one carb bank is running too lean and would like to even it up. Can’t seem to find a mixture jet/screw......or am I just being a bit dumb??!! To adjust the mixture you must remove the Air Valve Piston by first removing the top of the Vacuum Chamber. 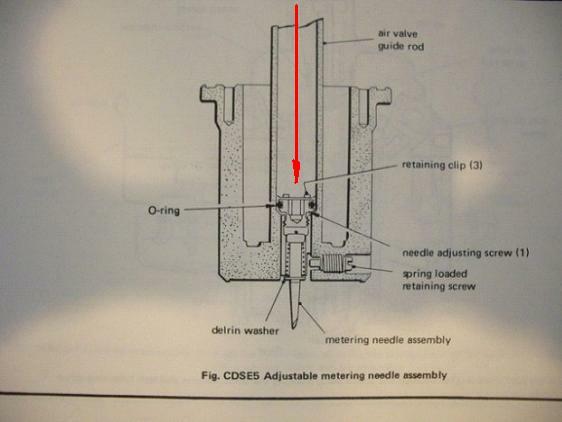 The following pictures show the general layout of the Metering Needle Assembly and the Special Tool (long Allen Key and Guide Bush) required to make the adjustment. 1. Once you have the Air Valve Piston removed from the Carburetor, loosen the Metering Needle Lock Screw visible on the side of the piston, close to its bottom end. 2. Place the Guide Bush of the Special Tool in the bore of the Air Valve Guide Tube and ensure that the pin on the underside of the step of the Guide Bush has engaged with the slot in the mouth of the Air Valve Guide Tube. 3. Insert the Allen Key in the bore of the Guide Bush and engage it with the Metering Needle Adjusting Screw at the bottom of the Air Valve Guide Tube (See Picture of Metering Needle Assembly). 5. Return the Air Valve Piston to the carburetor and replace top of vacuum chamber. 7. 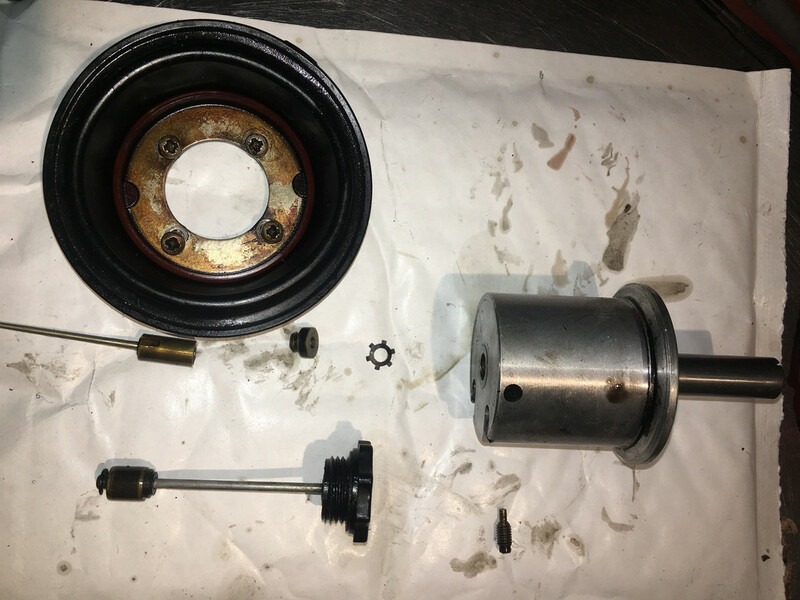 Further adjustment can be made with the Air Valve Piston in place by removing the Dash Pot Piston and inserting the Special Tool as detailed in 2 and 3 above. 8. When the desired result is obtained, make sure that the Metering Needle Lock Screw has been tightened before calling the job finished. Last edited by angelw on Sun Jul 15, 2018 10:34 am, edited 2 times in total. Obvious question now is where to get the special tool? I would start by ringing SNG. A quick google search for stromberg mixture adjusting tool yielded several UK suppliers. Dad: You’ll have to choose. I found that the needle holder can move freely up and down even if the retaining screw is fully turned in because the tip of the screw does not press against the needle holder. In fact I always check that the needle holder CAN move freelybup and down with the retaining screw fully turned in. The fact that in my case the retaining screw does not lock my needles would imply that ALL the retaining screw tips are too short. Does that imply that there are versions of Strombergs that DID lock the needle holders? Last edited by jagwit on Fri Jul 20, 2018 2:57 am, edited 1 time in total. Also, the picture you posted, labels the retaining screw as being "spring loaded". Mine are not. In my case there is no way a spring could exist in that retaining screw position AND there is no point to having them spring loaded in my case. Again I wonder if there are different versions of Strombergs where some retaining screws do have springs and others don't? I found this photo of the screw in the same article that the previous photo came from. The article was posted by the TR group and describes strip down and overhaul of strombergs around similar vintage to our cars. 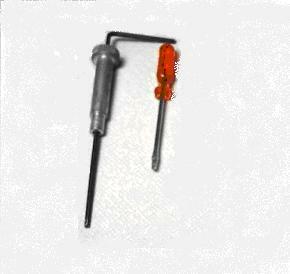 It has a spring loaded needle retaining screw. The little pointed bit at the end is spring loaded. As I recall the slot in the needle that it slides in is not flat but on an angle which the tip slides along. Having rebuilt several V12 Strombergs, I have never come across the retaining spring shown in Marks photo. The small slot in the brass ferrule is indeed there to stop the needle from dropping out or rotating and is not clamped by the screw, if it was it would not be able to move up and down when adjusted. The slot has always been short, but straight, in my experience. Incidentally, changing the adjustment nut, or at least the seal prevents the damper fluid leaking out, a common problem with old carbs. Moss sell a generic jet adjusting tool very cheap, probably for Triumph or Rover. Mixture can only be done when all the other rubbish around the Strombergs is sorted. This consists of either adjusting or disabling the temperature bi metallic control valves(covered elsewhere} and cranking up the anti pop valves that can also leak air, I disabled them. Once you know you have no vacuum leaks you can set it. leak. I then installed 4 Colourtune units one for each bank of carbs. This told be if I was in the ball park on mixtures as the rear banks ran hotter. I also used a vacuum gauge on the inlets to get even airflows on tickover. The Colourtunes did help in getting a good mixture on tick over as one carb was lean. I would say that if you don't have the Colourtunes then set them maximum rich and back off a little. Even aitflow on each carb is important. Understanding what the screws on linkage bars do is a learning curve in as much as you do one thing here and it messes up the other one there! You can do spark plug reads after runs to fine tune the mixtures using centre plug for each set of four. Under bonnet heat has bad effects.